Again, to the end of our set of three... this is an... otherworldly type of individual. 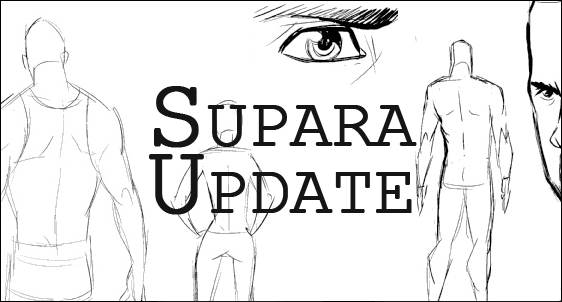 We've already established him within a previous entry (Supara Update #3: Early Era Characters) but he's quite integral to our present day story as well. Some of this you've already read before but things could have changed for him in the past 30 years or so. Oh and another reason why you should check this entry out... the art. There isn't a lot of it but it's phenomenal nonetheless. See it all and more... after the jump. All artwork is courtesy of the talented Michael Mayne. 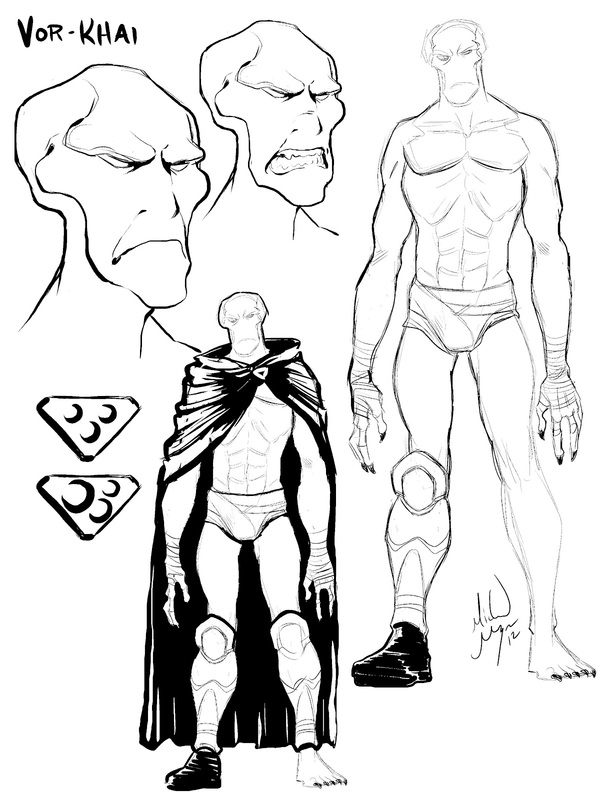 You can find/follow him on devaintART, Blogspot, and Twitter. This healthy looking, happy-go-lucky, creature of many hugs from far away is Vor-Khai. He's actually a pretty well tempered guy with a lot of memory issues. You'll find out soon enough. I wanted to have him stripped down of any kind of armor because when he reappears from his 30+ absence, he's surviving as he would on is own planet. I tried not to be influenced by any one particular alien race but when you've seen one, you've almost seen them all. I enjoy the simplicity of his outfit because how complex his anatomy and body type is. Every muscle has it's purpose and that'll show through when Khai is in action. Visceral Athlete – His body lends itself to pull off incredible feats that are twice what any human can pull off. Basically everything that the top athlete in any given category can do physically; Khai can do almost double. 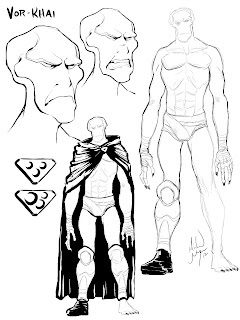 Q'wenu Footed (parkour) – Khai's ability to move fluidly through his lush, jungle home planet; allows him to move even quicker here on Earth. Trained Hypermobility - Khai can disjoint his body/limbs to fit into otherwise smaller spaces and limited in combat usage to avoid damage. Ka'Vor Warrior - Trained by his people, Khai fights with a unique fluid combination of what looks like Kung-Fu, Savate, and Jiu-Jitsu. Khai was born nearly 100 Earth years ago on the war torn planet of Q'wenu. At a young age... he was forced to fight in a seemingly never ending civil war between the Ka'shasi and the Chunar. 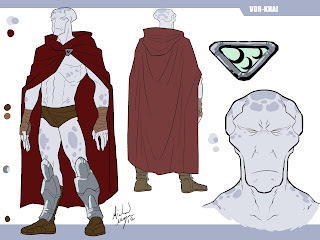 He would eventually train to become one of the 7 Ka'Vor; the highest ranking and most skilled protectors of their High Queen Silaria. This would declare him near royalty earning him the title of 'Vor' or 'High Brother'. Before all hope diminished among the remaining population, Silaria would send each of her Ka'Vor to different galaxies seeking aid. And just like the others, Vor-Khai would follow suit. Silaria would send a medallion with each Vor, representing hope in the form of the 3 moons of Q'wenu. On the back reads [translated from Ka'shaian], "May the moons grant to you passage, and may they bring you home. Never forget High Brother, that you're never alone." 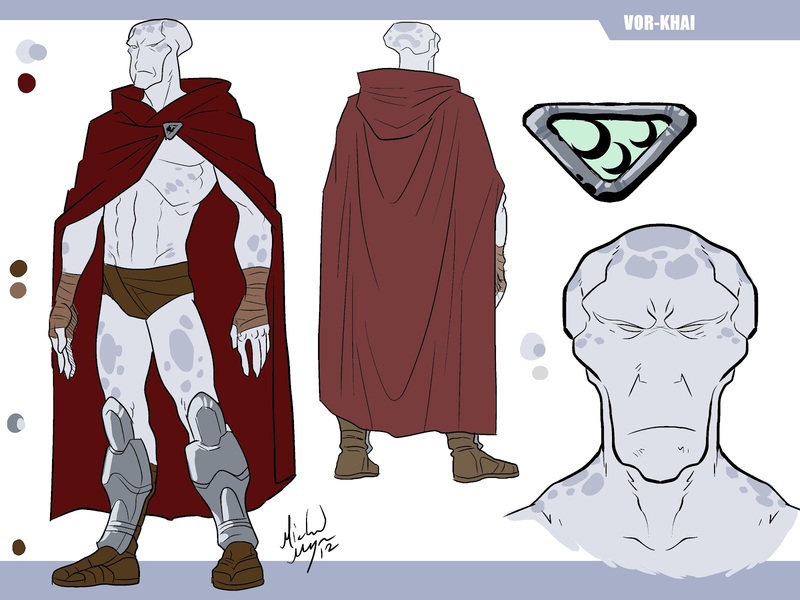 Vor-Khai would then be sent off... and for reasons yet unexplained within in his frozen state, the ship would then crash in Roswell, NM. Completely off course from his predefined destination; even in the wrong galaxy. When he awoke in complete shock, he was being held by the United State's National Division of Sciences with near complete memory loss. Only remembering his name, skills, vague flashes of mass death resembling extinction... but his mission was a loss. The NDS would then recruit and study Khai in the most passive way possible. Hopefully using him as an asset rather than a prisoner. Overtime, Khai excelled in any training course and class he attended. He also discovered how fragile the human race is and how short their lives are regardless of war. Recognizing the destruction of World War 2, Khai wanted to help... so the NDS set him up a name (Marcus), costume, and alias (Imperial)... then introduced him as a member of their new policing force, "The Foundation". On Earth, Khai is a very cautious individual. He tries to be civil at every turn unless he's forced to defend himself. Khai is also quite tame and tends to be more insightful than he lets on. In his mind, everything is up for question because he knows he doesn't remember his past clearly. And that very thought haunts him to his core. Khai's a wise survivalist that's lost among warmongers and his mission still isn't complete. That's all he knows. Khai is something we want to build on in many different ways. He's a gateway to the past being a founding member of "The Foundation" and he's also attached to another rich and overly developed story from beyond the stars. He's the all knowing guardian for this new generation of Powers and a key part to the story as a whole. Here's the final sketch for Khai and doesn't he look magnificent? Comparing to the first sketch, we shortened up his arms a little to give him more human proportions and changed his demeanor instead of the growl-y one (though I personally like that one but it isn't the best representation of his personality). You might be wondering what he used to look like when he was with The Foundation but that's still up for discussion internally. We know he's almost armored to the core not revealing much of his alien-ness but that'll be in another entry at a later date. Also the medallion has a larger back-story but I'm going to leave that for the books. Whoop-whoop! We're done with our second set guys! I'm excited and tired all the same. Once again and always... check out Mister Michael Mayne's work on his deviantART page. It's awesome. He also has his own comic called "Bonnie Lass" that's worth checking out as well. All sorts of funny in there. I'm done now. Thanks again. Out!